Turkish national leader and founder of modern Turkey. 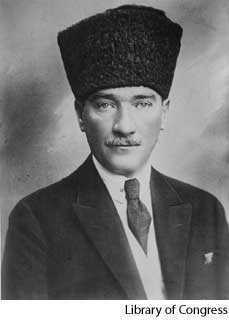 In 1919 he organized the Turkish Nationalist Party and established a rival government to the Ottoman sultan. After a civil war he served as president of the Turkish Republic (1923-1938). "Kemal Ataturk." YourDictionary, n.d. Web. 13 April 2019. <https://www.yourdictionary.com/kemal-ataturk>.